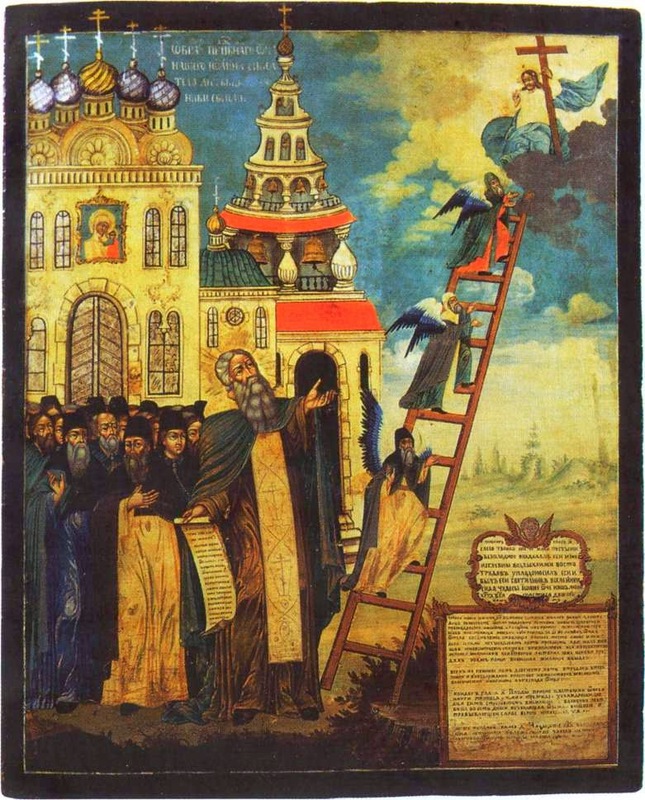 "The Ladder is one of the most ambitious ascetical writings" (Archimandrite Sophrony). Within its chapters gush the entire fragrance of holy patristic Tradition, but it also reveals the entire personality of the Saint. When one writes, then deliberately or inadvertently they "expose themselves", according to the common saying. Saint John, with what he recorded on paper, reveals that what he writes are his personal experience. This is why his words are alive and have an immediacy. They penetrate deep within the soul, touch the most sensitive chords, and create devotion and a mood for prayer. It's a short story, describing all that he saw, heard and touched. Those who know God, don't squeeze out their brains to write beautiful thoughts and reflections, but their words gush out of their pure hearts. They are not words about God, but words of God, which is why they do not create confusion or problems, but instead they help solve problems, and bring calm and rest. It is satisfying food and a well of refreshment for those who hunger and thirst for the love and justice of God. It contains "thirty discourses, each including one virtue that lead a person by ascent from the life of praxis to theoria as steps to the heights of heaven" (Synaxarion). The titles of some of these discourses are: "On the Renunciation of this Vain Life of Suffering", "On Exile, as well as On Dreams", "On Talkativeness and Silence", "On Discernment of Thoughts, Passions and Virtues", "On Prayer, the Mother of Virtues", "On the Linking Together of the Supreme Trinity Among the Virtues: Faith, Hope and Love", etc. When you read books like the Ladder, you feel more human. And if you try to live the content, then you acquire meaning in life. You change your attitude and mode of behavior for the better, simply and naturally, perhaps imperceptibly, without being perceived by logical processes. Thus, it is as a teenager when they become taller from one day to another without noticing much of a difference, but nevertheless they experience it and rejoice. "There is an enormous qualitative difference between spiritual understanding and the 'psychological' perception of phenomena. If we try to discern the usual perceptions of people on holiness, love and meekness in general, we will see that it is incompatible with what corresponds to the Gospel. Thus meekness is perceived as a natural 'peaceful ethos'. Saint John of the Ladder defines it as something entirely different. He says: 'Meekness is an unchangeable state of mind, which remains the same in honor and dishonor.... Meekness is a rock overlooking the sea of anger, which breaks all the waves that dash against it, yet remains completely unmoved.... Meekness is the buttress of patience, the door, or rather, the mother of love, and the foundations of discernment,... it is boldness in prayer, an abode of the Holy Spirit.... Meekness is the fellow worker of obedience, the guide of the brotherhood, a curb for the furious, a check to the irritable, a minister of joy, the imitation of Christ, something proper to angels, shackles for demons, a shield against peevishness.' We observe, therefore, that this is a far superior condition than the 'psychiatric'. Because in the Ladder meekness means spiritual brawniness with the ability to bring upon it the burdens and illnesses of others. It is an ongoing readiness to endure insults and to remain internally untroubled by praises; peaceful perseverance in all tribulations, even unto death; within it is enclosed great power and victory over the world. Christ says: 'Blessed are the meek, for they shall inherit the earth,' namely they will conquer and dominate the world in the highest meaning of the word. The earth, namely the world, will not bow down to a rough material power, but to meekness" (Asceticism and Theoria). 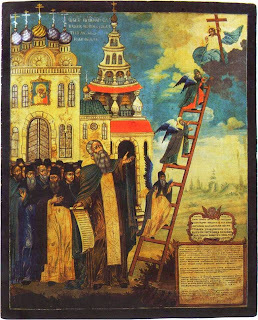 The 23rd discourse of the Ladder of the Saint shows the way to war against thoughts of blasphemy. He says, among other things, that when a person begins to pray, either in common worship or alone, then the devil brings various thoughts and images to distract them. The devil leaves as soon as they are finished praying. In this way he has made many not want to pray because they consider themselves unworthy or sinful. He has also made many distance themselves from Divine Communion, because they think those sinful thoughts are theirs. But they aren't theirs, they are the devils, and they haven't sinned if they haven't consented. He stresses the need to seek advice from a spiritual father. He cites the example of a monk who was afflicted with blasphemous thoughts for twenty years and in the end was healed because he revealed his problem to his spiritual father. For those who take the matter of their spiritual life seriously, the Ladder is necessary. For everyone else it is more than necessary. It is a spiritual mirror, as well as a "support and supplication of the heart." Source: Ekklesiastiki Paremvasi, "ΑΓΙΟΣ ΙΩΑΝΝΗΣ ΤΗΣ ΚΛΙΜΑΚΟΣ", March 1999. Translated by John Sanidopoulos.